How do you bring about the change you want to see? Live in harmony with earth and contribute to world peace. Here is a simple dome anyone can build. This single dome contains all of the necessities for habitation. In addition to the basics, you could incorporate solar hot water, greywater recycling, composting toilet (shown, although a flush toilet can be used) to further reduce your ecological footprint. There are hot/cold, wet/dry climate design options available. 19′ interior diameter, 283 sq. ft. interior main floor, 169 sq. ft. (16′ diameter) bedroom loft, total = 452 sq. 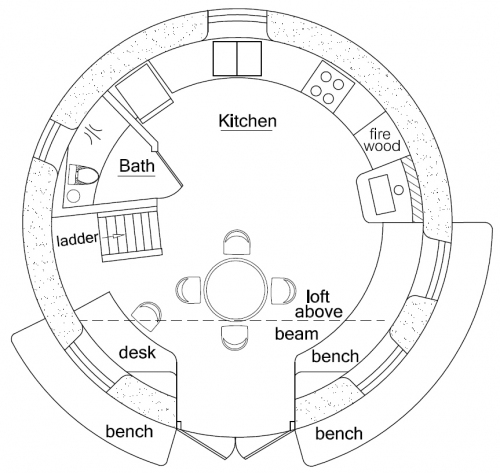 ft. interior, 1 bath; footprint: 22′ diameter. We live in Louisiana and receive about 4 to 4.5 of rain on average. We have mild winters between 45F to 60F and our summers are just hot (95F to 102F). Would you recommend using the dome with this plan are applying a roof with extended eaves? We are wanting to build using passive solar techniques as to be as energy independent as possible. Currently we are in the planning/self education stages now. Love the size of this dome as our family dome and want add our teen sons their on smaller domes later in a courtyard like setting. 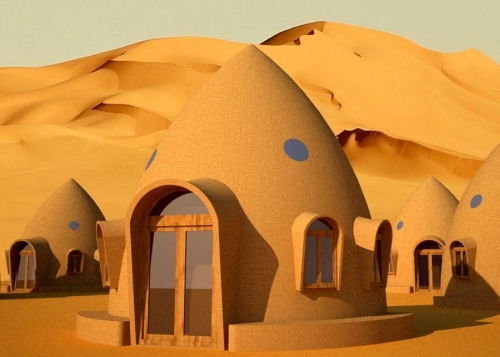 I recommend roofed domes unless you’re building in a desert. Better safe than sorry. Lots of people have trouble with leaky domes. These are fantastic designs. Are they code legal in the Bahamas and is it ok to mainly use sand for the fill? Sand filled bags are inherently unstable because the sand can shift. Sand will work though if you add a stabilizer such as lime, cement, etc. One option in the Bahamas is to use coral dredgings like they did on the Sand Castle. This design would be hard to get code approved because typically it will not meet minimum living space requirements. Governments want larger homes so they can charge higher taxes. They don’t really care about poor people who can’t afford larger homes. What some people do is join multiple small designs with breezeways, etc. Rounded shapes are strongest in hurricane areas because the wind will blow around the structure instead of building up pressure against it. I’m actually thinking of building a group of these to rent as individual rooms airbnb-like, along with something like a peace dome 2 as a main residence. Very interesting design and, of course, eco efficient. I’ll build a smaller version first to test the design and my skills. That can work if you don’t have codes. Hi, how high is the peace dome? I really like this design, and I especially like your comment about anyone being able to build this structure. Would this design be suitable for areas with heavy snowfall? If not, what set of plans would you recommend? What is the largest size for this set of plans? Is it possible to use an extra layer of bags filled with gravel in order to have the door a bit farther above ground level (to avoid the snow)? Domes evolved in deserts, so you’ll need to make some changes for snowy/wet climates. Two main approaches: 1. build a roofed dome. Search our Projects pages at Earthbag Building.com to see several examples. 2. build a ferrocement rainscreen on the exterior of the dome. The rainscreen is basically an outer cement shell that’s built on top of the dome with about 1″ space between. Add L-shaped 1/4″ rebar pins every 12″ on the exterior. Tie plaster mesh or similar mesh to the rebar and then cover with 2-3 coats of cement plaster. You can make larger versions of the Peace Dome. 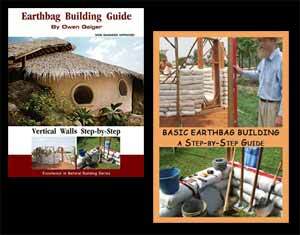 Just realize that earthbag building is laborious and there’s a learning curve to everything. It’s good to do a small project first and go from there. Yes, you can raise the dome on extra layers of gravel bags. Besides raising the structure and protecting against moisture damage, this would also create space for insulation under the floor. Scoria or pumice are popular insulation choices among natural builders. I love this design, but before I purchase the plans, what building materials does it require? Is it earth bag? straw bale? Thanks! Earthbag. Straw bale domes are too vulnerable to moisture damage.